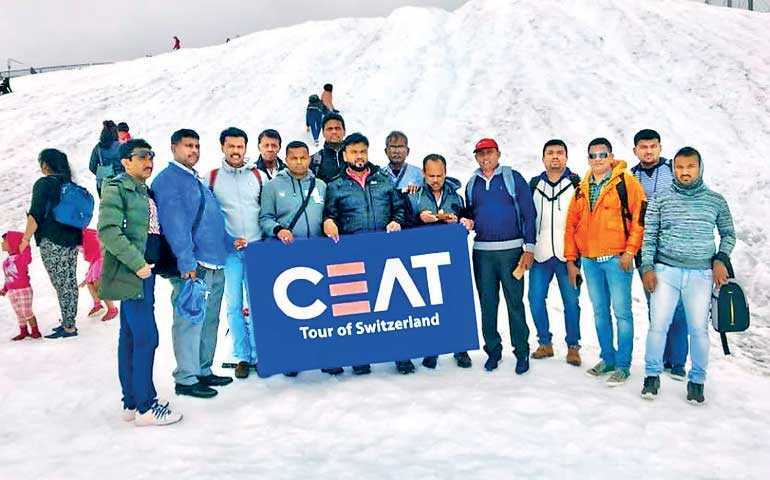 Twelve truck dealers and two motorcycle distributors who excelled in a promotion by CEAT were treated to a five-day tour of Switzerland, by Sri Lanka’s leading tyre brand. The tour included visits to Switzerland’s iconic sights such as the Rhine Falls, Black Forest, Lake Titisee, and Mount Titlis and encompassed excursions in Zurich, the wine growing region of Schaffhausen, and Lucerne and its epochal landmarks of the Lion Monument, Chapel Bridge, and the Water Tower. CEAT’s touring dealers and distributors also enjoyed ample leisure time to discover the beautiful landscapes and indulge in shopping expeditions. CEAT provided return tickets, hotel accommodation, all meals, transfers within the tour, and tour guide assistance. Notably, in an effort to consolidate its relationship with Sri Lankan tyre dealers, CEAT also recently launched a four-tiered loyalty program titled ‘CEAT Privilege Class’ that confers rewards proportionate to the sales dealers generate for the brand. The first scheme of such depth and scope in the sector, this program was set in place to motivate dealers to achieve and maintain tier targets and to progress upwards, earning greater rewards as they increase sales. Additionally, CEAT honours its top dealers for their contribution to the brand’s growth at a grand annual ‘Dealer Awards’ ceremony at which dealers are presented cash awards, trophies and certificates in recognition of their performances in each of CEAT’s product categories, as well for overall excellence. CEAT Kelani’s manufacturing operations in Sri Lanka encompass the radial, commercial, motorcycle, three-wheeler and agricultural vehicle segments. The brand accounts for market shares of 33% in the radial segment, 52% in the truck/light truck category, 50% in the three-wheeler segment, 26% in the motorcycle segment and 72% in the agricultural tyre category. About a third of CEAT’s production is exported.